Reyes Roofing Contractors, LLC is the best among roofing companies in Falls Church, VA.
Reyes Roofing Contractors, LLC offers the best quality roofing materials and service in the Falls Church, VA area. If you are experiencing a roof with leaking, aged, missing or curling shingles, deterioration of wood or heat loss, then it may be time to think about having your roof replaced. Our certified roofing contractors will evaluate the condition of your roof and offer suggestions based on the latest products and technical knowledge so that you can make informed decisions about your roof repair. There are many roofing companies out there, but Reyes Roofing Contractors, LLC is committed to professionalism, quality of work and customer service. 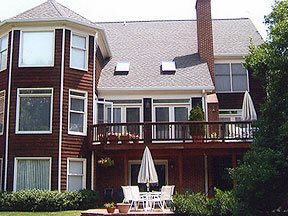 For more than 20 years we have been providing residential and commercial roof repairs and installation in Falls Church, VA and the surrounding communities. We are a member of the National Roofing Contractors Association and the Virginia Association of Roofing Professionals, and all of Reyes Roofing Contractors, LLC employees are uniformed, drive marked vehicles, and are CertainTeed Certified Master Shingle Applicators. In addition to residential and commercial roof repair and installation, we also install siding, various ventilation systems, attic insulation, windows, gutters, skylights, flashing, downspouts systems, concrete patios and driveways, and more! Here is a sample of some of our roofing projects. 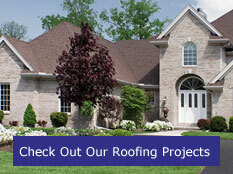 Receive a free, no-obligation roofing estimate. Contact us with any of your Falls Church, VA roofing questions at Reyes Roofing Contractors, LLC.